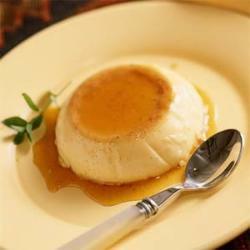 This flan is of the creme caramel variety. It couldn't be easier to make. Nice sweet but light-on-the-stomach dessert. 2. In a pan over a low to medium heat, mix the 200g sugar with the water. Let the sugar caramelise until it becomes a golden brown colour. 3. Pour into a flan or baking dish, ensuring it covers every part of the bottom of dish. Leave aside to cool and harden. 4. In a measuring jug, pour in the tin of evaporated milk. Add regular milk to the evaporated so that the mixture comes to 600ml (1 pint) of milk altogether. Heat the mixture in the microwave for three minutes. 5. Remove from microwave and beat in the four eggs, mix in the sugar and vanilla. Whisk well. 6. Strain it into the dish with the caramel (we strain it so that the egg bits do not go through). 7. Place the oven dish in another dish or tin filled with warm water. This is so that while the dessert cooks the caramel can melt. 8. Leave to cook in preheated oven for about 1 hour. Check with knife. The dessert shouldn't be runny, but not hard either. 9. When cooked, remove from oven and leave to cool for a bit. Then cover it with cling film or foil, and leave it to chill in fridge. 10. To serve: Once cool, run a knife round the edges and turn it over onto a tray. Slice into pieces and serve cold. The syrup may be poured over it as well when serving. Tips to Grow Your MISI Shop In Spring!